A group of more than sixty academics, teachers and policy workers met in the Israeli city of Beersheba to reflect on the state of citizenship education in Israel ten years after the Kremnitzer Report (1996). 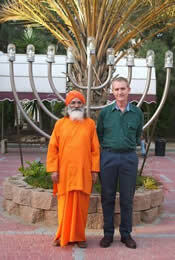 Dada Shambhushivananda, Marcus Bussey (Australia) and Radhika Shany (Israel) were amongst the participants and all presented information on Neohumanist Education and its potential to engage the problems facing Israeli society and education. Dada Shambhushivananda gave a keynote speech entitled “Global Citizen in a Global Era: a neohumanist perspective” and Marcus Bussey gave a workshop on Neohumanist Futures Education. In these two sessions the focus was on developing the spiritual potential latent in the dynamics of the Israeli situation. P.R. Sarkar’s dictum of ‘subjective approach through objective adjustment’ is most relevant in a society divided amongst ultra orthodox Jews, orthodox Jews, secular Jews, Muslims, Palestinian Arabs and the Druz. Only such an approach allows for the layered and accommodating approach that would create a space for tolerance without diminishing any of the parties. Dada had the group doing kiirtana and kaoshikii and created quite a stir, in his orange, amongst both participants and other visitors to the centre – especially the young Bedouin boys. The openness of the organisers and their desire to allow for multiple spiritual representation was impressive as there were with dada numerous rabbis of various persuasions, a Christian minister and a Druz elder. Dada’s opening remarks are included next. They were followed by a slide presentation and talk on the subject.